Click HERE tocontact Customer Service. Live Sound International is the most established, dynamic and respected voice on professional live sound practices and technologies. With every issue, Live Sound International delivers rich content raging in topic from product reviews, to successful strategies proven to thrive in a challenging economy. No matter what role you play within the pro audio field, Live Sound International is the ultimate resource for you. 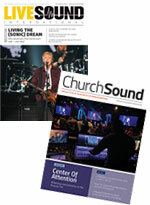 Live Sound International, is the magazine arm of ProSoundWeb.com, the largest online website for pro audio professionals.